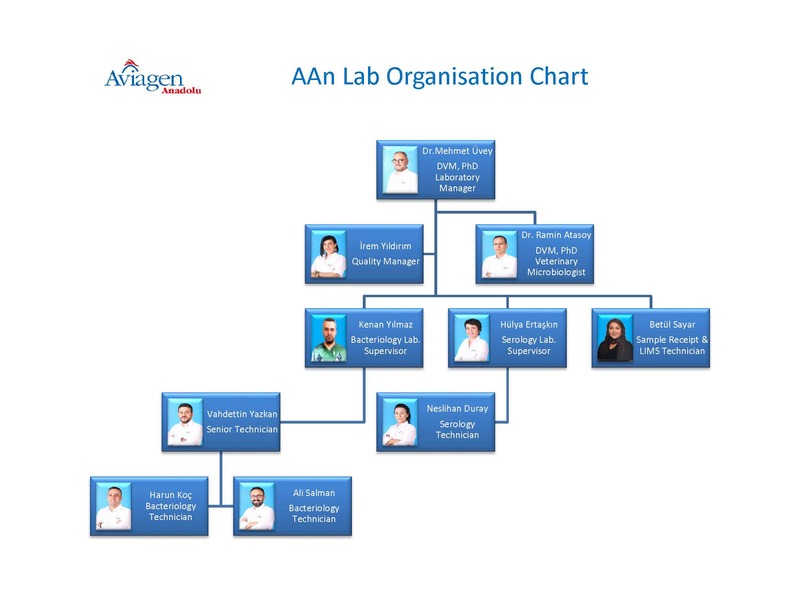 Aviagen Anadolu Poultry Diagnostic and Analysis Laboratory was established upon the acquisition of tools and equipment, as well as the media and chemicals of the central laboratory of Köy-Tür Entegre Tavukçuluk Sanayi ve Ticaret A.Ş. on 1 April 2003; with the aim to allow the increasing number of analyses to be performed at a laboratory would then belong to Ross Breeders Anadolu Ana Damızlık Tavukçuluk Sanayi ve Ticaret A.Ş. within the framework of their plans towards expansion. Throughout the search for a suitable place; the tools and equipment that were stored in storage, as well as media, were moved to a rented building in Kırkkonaklar that which was in accordance with the legal regulations of that time. Following the transfer, the laboratory acquired a Work Permit for Veterinary Diagnostic and Analytical Laboratories from the Ministry of Agriculture and Rural Affairs General Directorate of Protection and Control; in accordance with the legal regulations of that time with the name "Ross Breeders Anadolu Poultry Diagnostic and Analysis Laboratory" on 23.09.2003; with the permit number TAL-4. Calibration and Test Laboratories Association, which is an associate member of EUROLAB European Federation of National Associations of Measurement, Testing and Analytical Laboratories. After a long and tedious process, the laboratory has taken pride in being the first Private Veterinary laboratory that has been accredited by TÜRKAK in Turkey. When transferring the laboratory to a new, expedient building came on the agenda in order to respond to the increasing customer demands in a timely fashion, and to comply with the latest regulations published by the Ministry of Food, Agriculture and Livestock on Veterinary Diagnostic and Analytical Laboratories; the current state of art laboratory facility opened its doors in late 2013. The "Work Permit Certificate for Veterinary Diagnostic and Analysis Laboratories" was updated on 21 March 2014 with the number TAL-4; in accordance with the provisions of "Regulation on Veterinary Diagnostic and Analytical Laboratories" that was published on the Official Journal no. 28139 dated 11.12.2011 and "Application Guidelines for Regulation on Veterinary Diagnostic and Analysis Laboratories" no. 45150 dated 10.12.2013; by the Ministry of Food, Agriculture and Livestock, General Directorate of Food and Control. The new laboratory that thus completely conforms with all the legal regulations and covers 800 square meters consists of administrative areas that include administrative offices, personnel rooms, showers, lavatories and food courts; as well as laboratory units that include sample reception, sample preparation area, bacteriology laboratory, serology laboratory, cleaning, decontamination, sterilization areas, storages for consumables and media preparation areas. In addition, a post mortem room and a temporary waste storage unit for waste from laboratories within the framework of related legal regulations are in place. A Molecular Biology Laboratory has been set up in late 2017, to provide support and to help diagnosing salmonella, Mycoplasma and IBV. All methods used are completely in compliance with those used at Aviagen UK. Laboratories and hold international recognition. Our laboratory has successfully completed the reviewing audits and achieved the accreditation (TS EN ISO/IEC 17025) which is an important step regarding the poultry sector and our country. Aviagen Anadolu Poultry Diagnostic and Analysis Laboratory declares that it will perform the requested testing services in accordance with TS EN ISO/IEC 1705 "General Conditions on the Proficiency of Test and Calibration Laboratories" and legal regulations and keeping the principles of privacy, impartiality, equality and truthfulness with trained and competent personnel. The analysis services that are offered are under the guarantee of our laboratory. The main goal of the quality management system that we have established is to provide accurate and reliable results to customers as quick as possible. All laboratory personnel are obliged to learn this policy and the documents regarding the quality management system and apply them throughout their tasks. Our laboratory certifies to improve and increase the efficiency of the quality management system by considering any complaints, discrepancies detected through internal and external audits and the data obtained from the management review meeting to make necessary adjustments. Click here to see the structure of our organization.